Throw cauliflower and chickpeas together on a sheet pan with some Indian spices and watch magic happen in this recipe for Roasted Cauliflower and Chickpeas with Indian Spices. 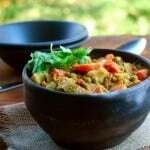 A vegan, gluten-free, soy-free and nut-free recipe. 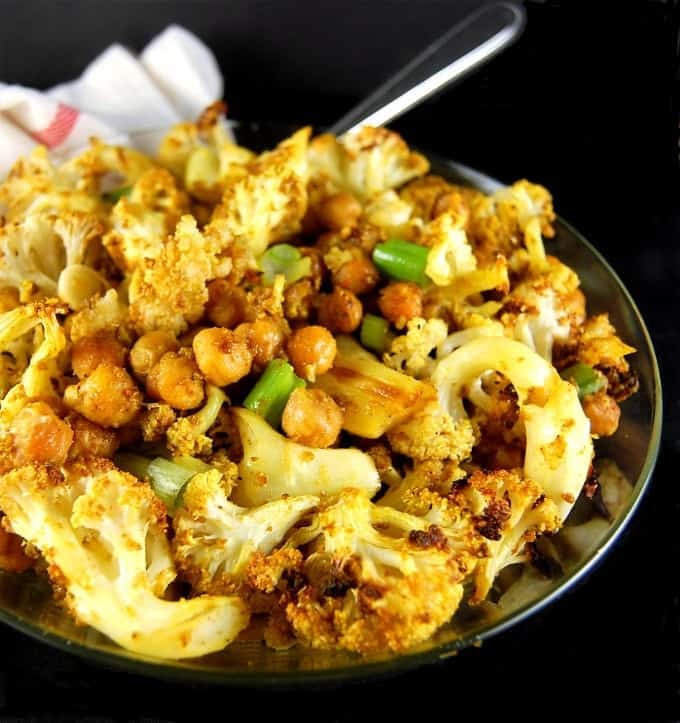 Cauliflower and chickpeas, chickpeas and cauliflower. 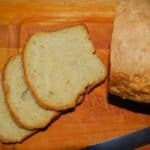 Not only do these two ingredients make for a healthy, rather perfect, marriage, they also taste incredibly good together. Even better, they alliterate. 🙂 And when you roast them together, that potent chemistry they already share turns into powerful food alchemy. I roast cauliflower all the time for a side, and I roast chickpeas all the time for a snack, but throwing them together on the baking sheet and letting them turn all golden — together — was a bit of a revelation to me. A happy one. And one that’s going to happen again and again in my kitchen. 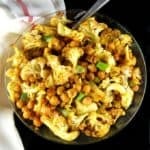 Like most roasted vegetables, there are all sorts of flavors you can try with your Roasted Cauliflower and Chickpeas. 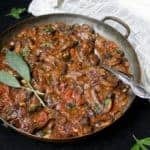 But my favorite, hands down, has got to be this mix of Indian spices that makes an already gorgeous dish absolutely divine. This is an incredibly simple dish. 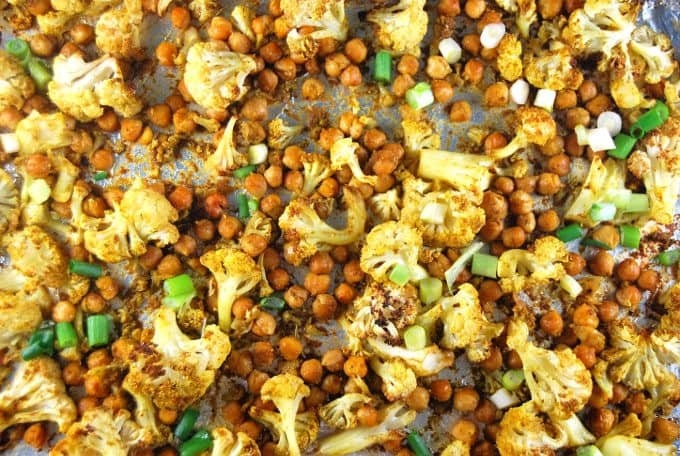 Separate your cauliflower into florets, drain your chickpeas, toss everything with the spices, and roast. I hate those recipes that ask you to stir chickpeas in the oven ever so often because, honestly, who enjoys standing over a hot oven, stirring? That horrid witch from Hansel and Gretel, perhaps, but not me. With this one, you have to stir just once — once, I promise — and your cauliflower and your chickpeas will thank you for it. Grab your oven mitts, then, and let’s get roasting. This one’s a keeper. 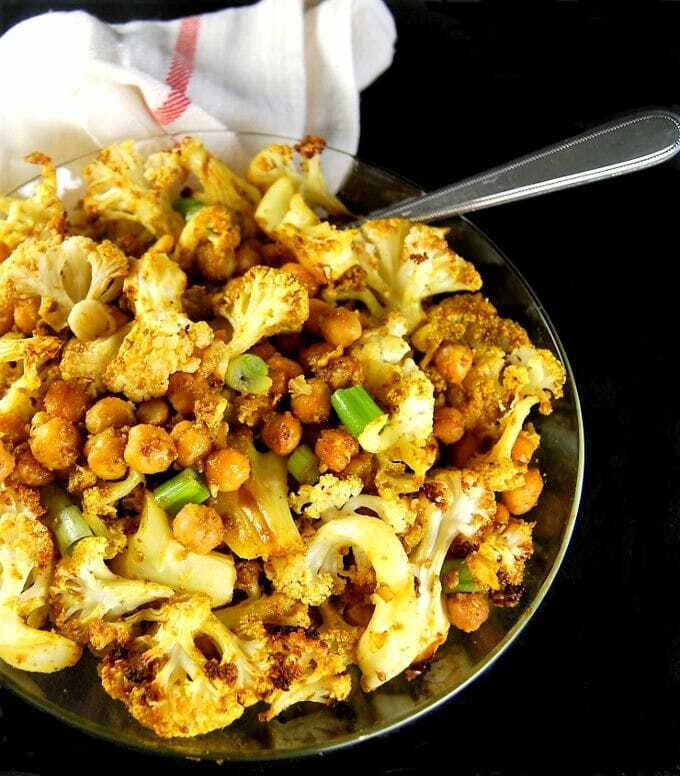 A tasty side dish of Roasted Cauliflower and Chickpeas tossed with a few simple Indian spices like coriander, cumin and garam masala. 5 spring onions or scallions, green and white parts finely chopped. 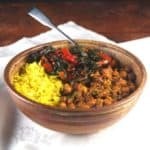 In a bowl, or on a foil-lined baking sheet, toss together all of the powdered spices, oil, salt, pepper, cauliflower and chickpeas. 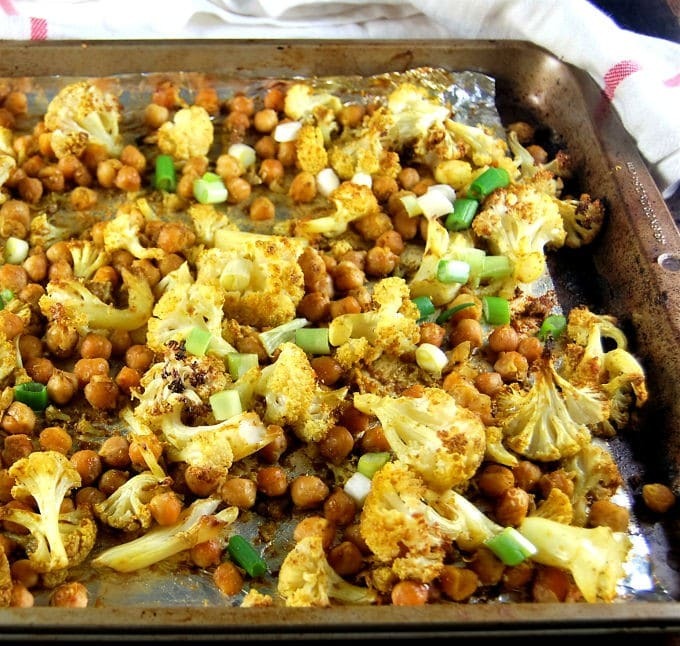 Spread the cauliflower and chickpeas evenly in a single layer of the sheet. Don't overcrowd the baking sheet or the vegetables won't roast, they'll steam. Bake for 40 minutes, stirring once, halfway through, to ensure the chickpeas and cauliflower get roasted evenly. Garnish with the spring onions and serve. Oops, yes, big typo. 🙂 Corrected. 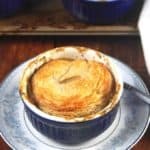 I am a huge fan of your website and your recipes. I have been using them for long time now. I tries to comment already multiple times, but the messages were rejected. I hope this time will receive the mail. Please keep up the awesome website!! And thank you so much. I just made this! Very good!!! Thank you! Kelly, that’s awesome. Thanks for letting me know! 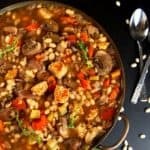 Can I use frozen cauliflower? I’ve got some to use up! I would say yes for a curry or a stir-fry, but perhaps not for roasting. This was DELICIOUS!!! Thank you so much! 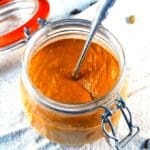 this is very good but too heavily spiced what kind of dressing would you use to top this to cool it down ? This was SO good. My teens just gobbled it up. I will be making this again and again. Thanks for the recipe. 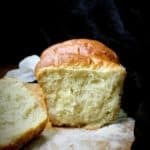 My wife and I are going to bring this allergy friendly recipe to share at our life group. Thank you! I just discovered your site. 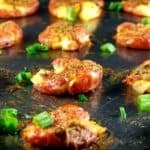 The recipes look amazing! 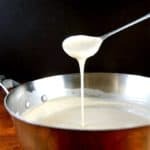 I’m going to make this tonight. Thank you! Cheers!